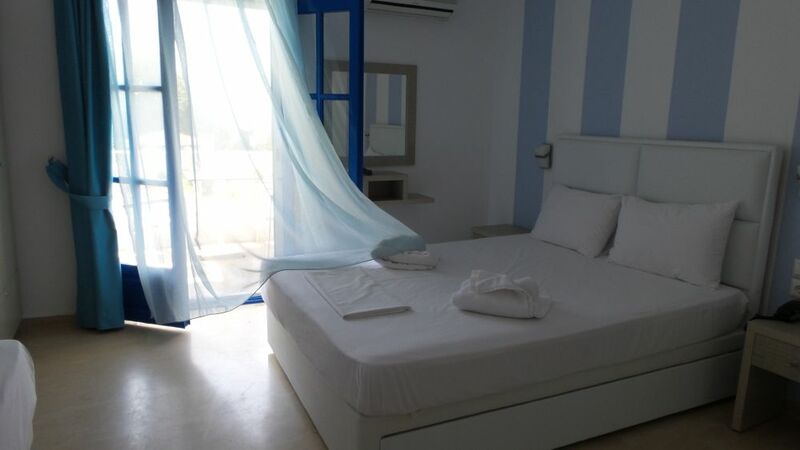 Just like I was surprised by Hotel Olympic Bibis in Metamorfosis, I was pleasantly surprised by Hotel Paraktio in Nea Kallikratia, Greecein the Halkidiki peninsula. I got an excellent deal for a 7-night stay in one of the refurbished studios, and I didn’t give it a second thought to visit this place. I pick dates that aren’t high season because I’m not a fan of crowded places. Places are easier to explore, and during the hot summer days it’s smarter to avoid direct sunlight. I returned to Hotel Paraktio for another four nights, after a week’s travel in Germany to Oktoberfest. So I wanted to update the Hotel Paraktio review I previously have written. I still stand by what I have previously mentioned in the review about the hotel. However, I want to let you guys know that the sea at the end of September is a completely different story than my first trip in August. 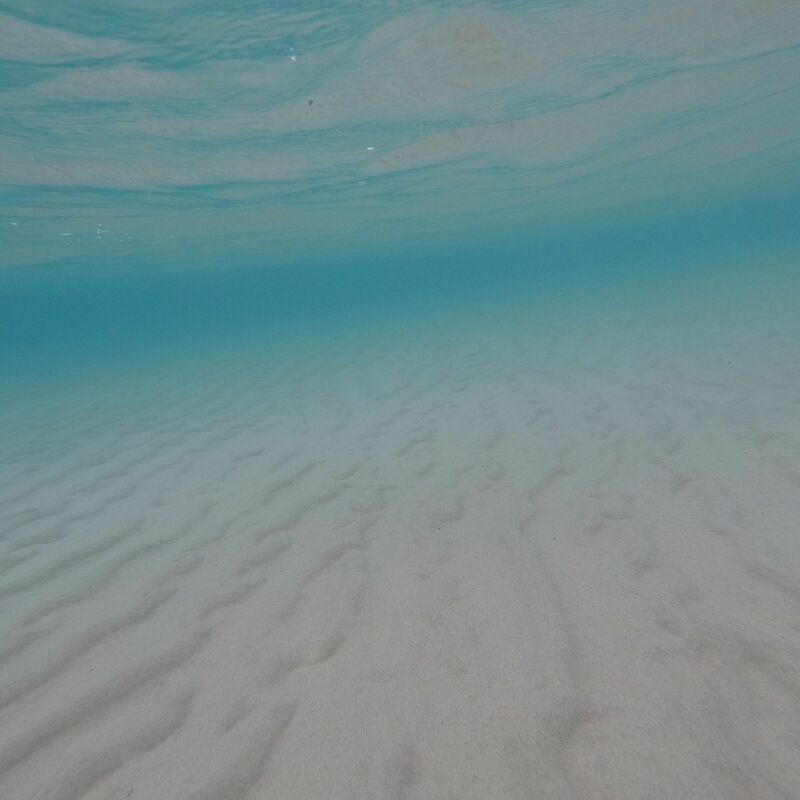 It was calm and crystal-clear for all five days. 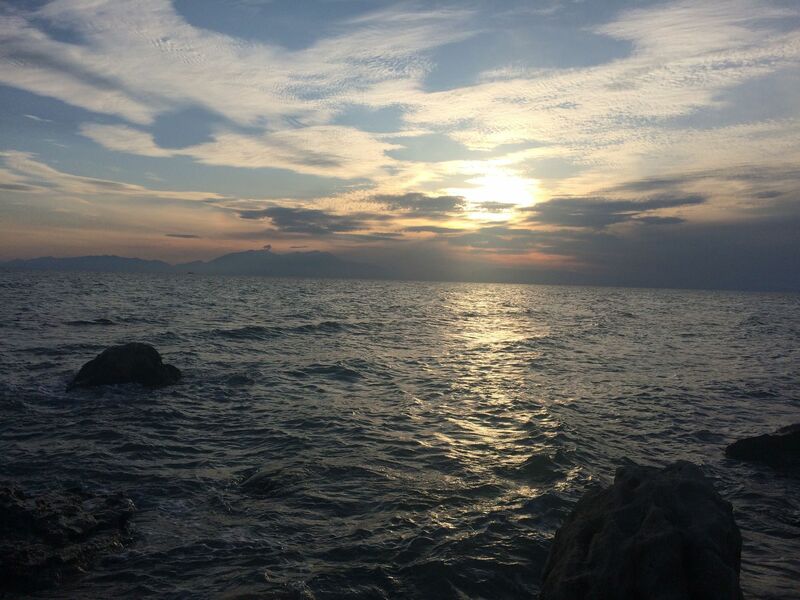 It was perfect for swimming, and for children to play in the water. Watching the sunsets only got better when there is no one around to spoil such beauty. Upon arriving at the hotel, one gentleman, which I believe was the owner’s brother, welcomed us into the courtyard. He got us checked in and showed us to our room. We were, also, informed that guests are allowed to park cars in front of the building the room is located. It sure beats carrying bags across the courtyard and your car can’t be any closer if you wish for it. I must admit that when we first got near the building I had mixed feelings because it looked neither new nor old. Plus, when we entered the reception area the atmosphere and decorations were somehow random. I got a feeling of entering someone’s house rather than a hotel. Nevertheless, this didn’t bother me, quite on the contrary it gave the place some inexplicable coziness. White and blue, the building is quite authentic and nice. It’s built smartly, that it offers sea-view to all rooms; hence, no policy for additional payments for a sea-view room. I didn’t spend lots of time in the hotel, but I noted that it was clean and the owners were obviously taking a good care of the place. The surroundings of the hotel i.e. the garden was really nice. There is a Greek statue, barbecues, showers, lots of trees and other plants and a kid’s playing area. Plus, the hotel is placed on top of a hill that offers a hard-to-forget view of the sea. I noticed that employees were constantly cleaning the hotel premises, taking care of the garden, etc. Inside the hotel premises guests can park their car in a large parking area under evergreen trees or in front of their building. I’ve been told that there are only a few renovated rooms in Hotel Paraktio, and the rest are old ones. I stayed in a renovated one and have only positive words for it; the room was really spacious and it was fully refurbished with new furniture, freshly painted, and a completely made-over bathroom. 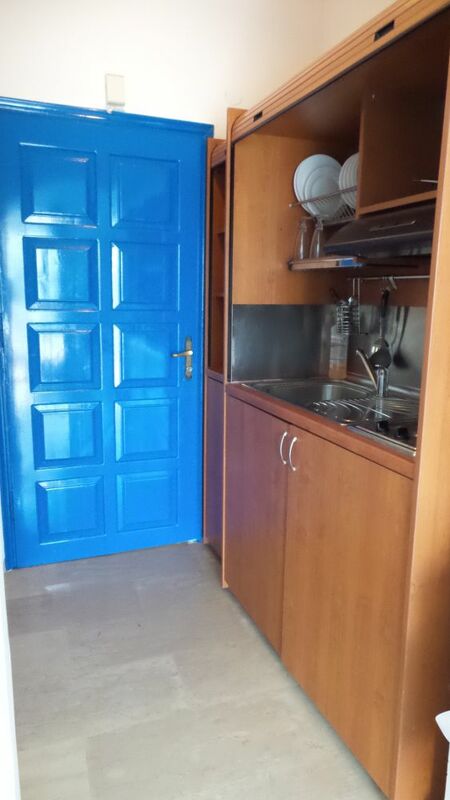 Plus, we had a fully equipped kitchen as well, which isn’t something common in hotels. We didn’t get in too much contact with the stuff because we were out for most of the time. However, as I said, the guy that welcomes us was great and very nice. We saw him on leaving as well, and he was once again very polite and friendly. Since we rarely want to just stay at one place for seven days, we spent most of our days exploring the area and what it has to offer. The beach in front of Hotel Paraktio, or rather across the road, is narrow and the sea gets quite muddy when there’s wind. You can use the sunbeds for free if you buy drinks from the bar. 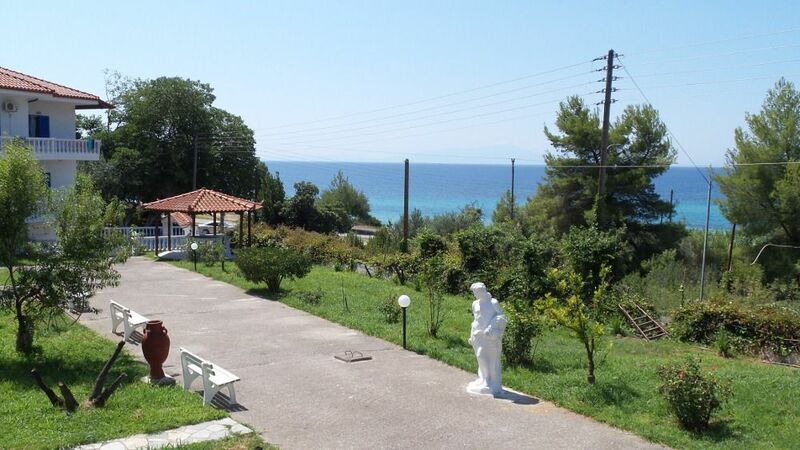 We found a great and close alternative only a half a kilometer down the hill on Mykoniatika Beach. 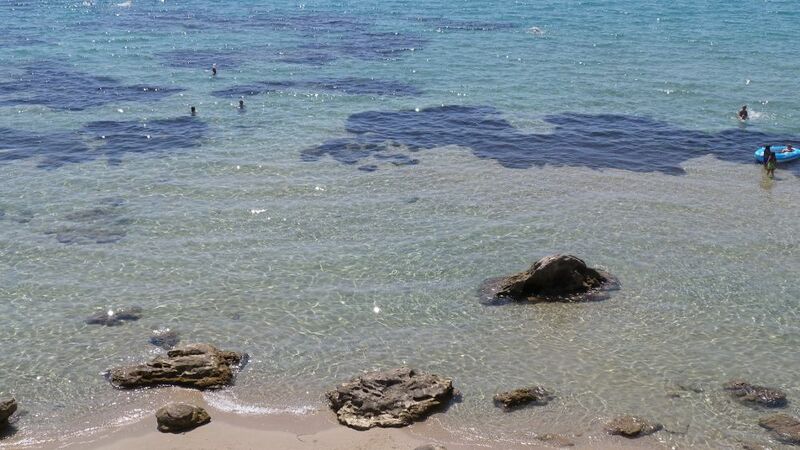 This is a wide and long sandy beach with clear waters and lots of restaurants and bars. View of Mykoniatika Beach from the hill. Ta Kymata Beach Bar offers free sunbeds with a purchase of drinks. Also, I recommend the Ta Kymata restaurant and the Giro pita. Besides beach bars, this beach also offers empty space for those that want to bring their own sunbeds and umbrellas. 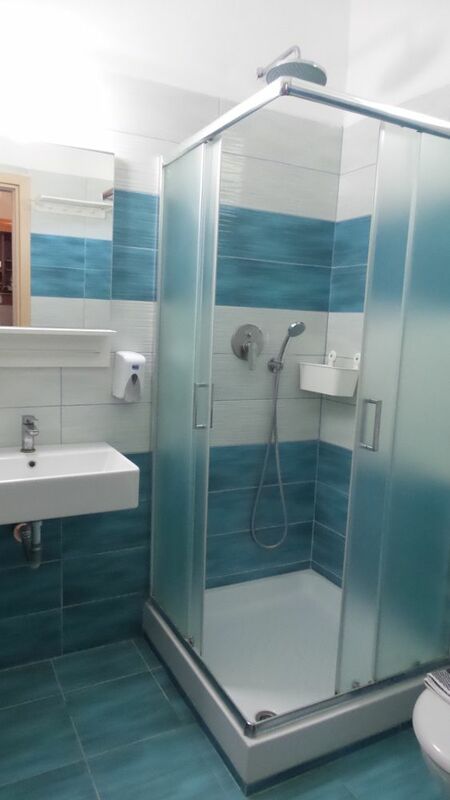 It has showers, bathrooms, changing rooms i.e. everything an organized beach should feature. We did some exploration in terms of sights as well; namely, we visited Petralona Cave and Ancient Olynthos. 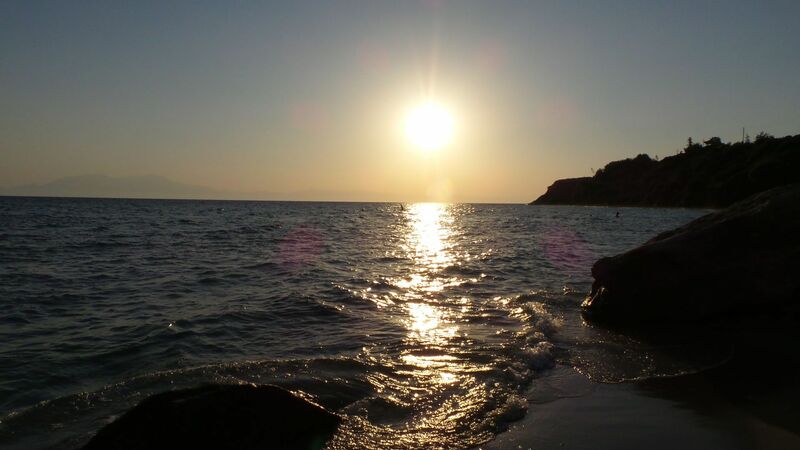 They are only located about 20km from the hotel, so it was worth seeing historical places in Greece, followed by hitting the beach for the rest of the day. The first is an extremely cool cave that features impressive stalactite and stalagmite formations, as well as remains of ancient humans and animals. Photography is not allowed inside the cave. This is a great 30-minute adventure I would recommend to anyone. Inside the cave it’s a bit chilly and it takes constant walking – so be prepared with long sleeves and sneakers. The entrance fee is 8 EUR. The second is an ancient city or, more precisely, its ruins. You park the car in front of the cashier where you pay 4 EUR entrance fee (2 EUR if you are a student or over 65 years old) and then you need to hike for about 10 minutes in order to reach the ruins. I wasn’t too happy with the adventure, but I guess it’s worth seeing if the day isn’t great for swimming and sunbathing. 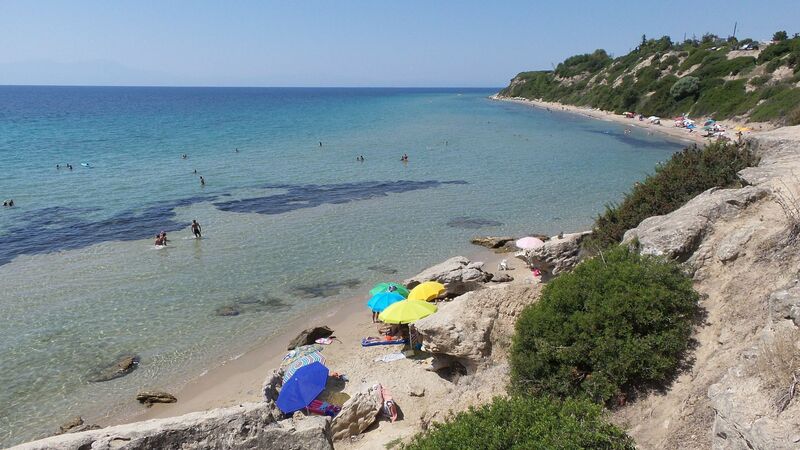 We also drove around a lot, we even went to the second and the first Chalkidiki fingers. 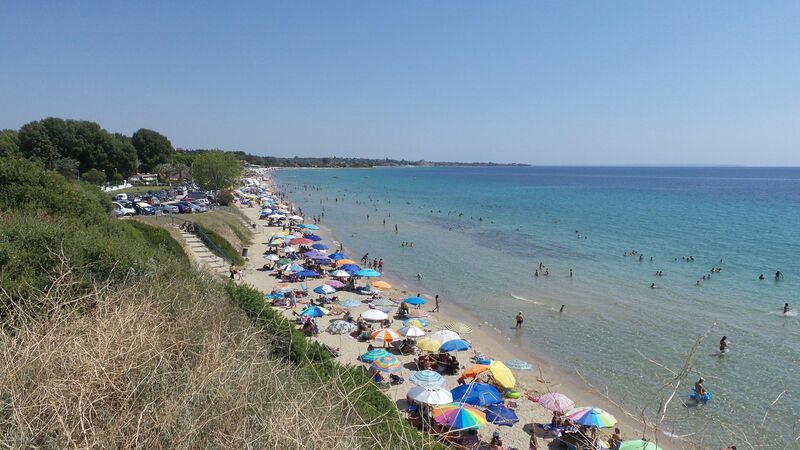 There you can enjoy popular beaches like the Karydi, Kalithea etc. Furthermore, I was nicely surprised by Dionisou, which was only 20 kilometers away from the hotel, toward Nea Moudania. It has a crystal-clear sea and a wide sandy beach. At the local bar, Dream Beach Bar, we enjoyed cool music, affordable drinks and free sunbeds (as long as you spend at least 2.5 EUR per person); highly recommended if you’re up to the 20-minute drive. 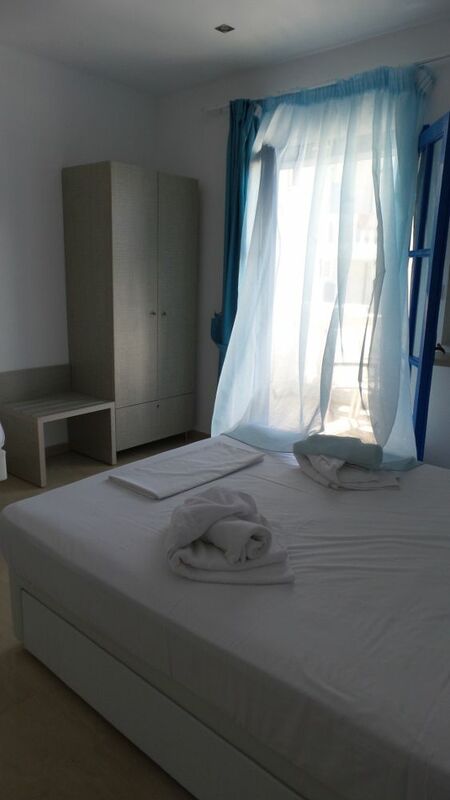 It is true that the beach is nothing special and even disappointing, but I believe that for the price we paid(affiliate link) we got excellent accommodation with good Wi-Fi signal, free A/C unit, kitchen, and modern furniture. I recommend this place and I sincerely hope to visit it again. 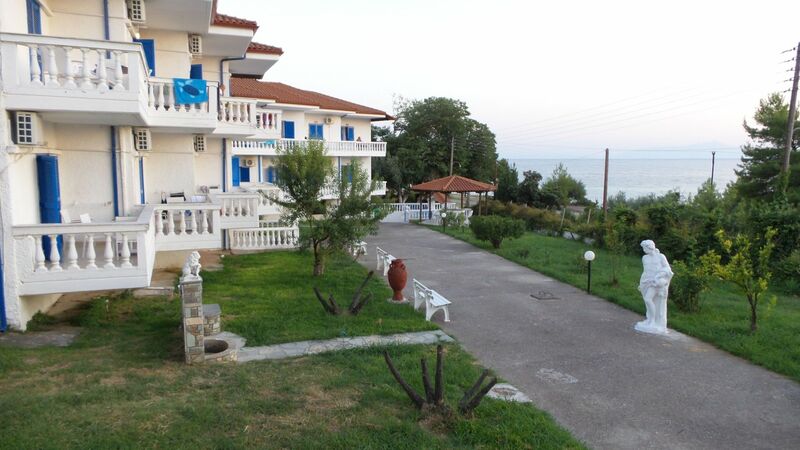 Hotel Paraktio offers an amazing seaview where you will see beautiful sunsets over the Greek sea. 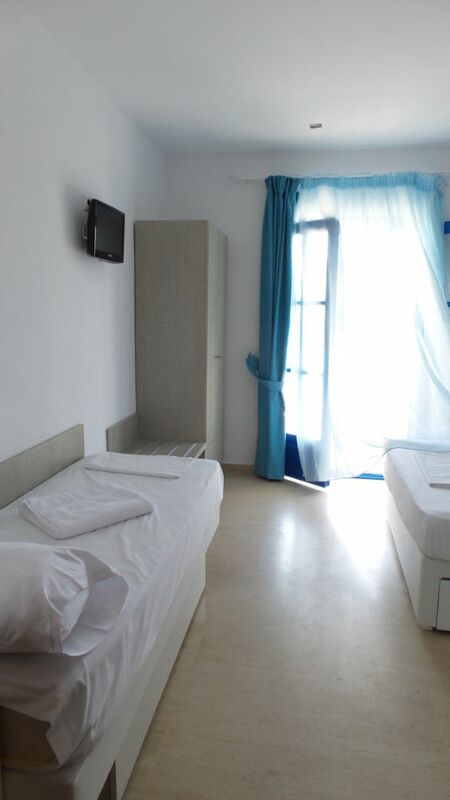 The accommodation has a good Wi-Fi signal, free A/C unit, kitchen, and modern furniture. The price for value was perfect for what the hotel offers. Far away from Nea Kallikratia if walking (car only 2-minutes).